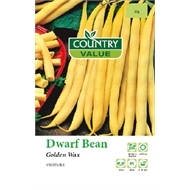 Country Value seeds produce this high yielding, strong growing dwarf beans. They have yellow, fleshy pods with terrific flavour. Protect from wind and keep well watered.